Our Survival Stories Project documents the lives of refugees from war-torn African countries currently living in Cape Town. Mary Tal was employed as project organiser from mid-August 2002 after completing the HRMC Oral History and Media Training Course. She interviewed 39 refugees from Angola, Democratic Republic of Congo, Burundi, Rwanda, Sudan, Uganda, Cameroon and Chad. Thirteen of these stories were selected, edited and compiled into a book titled Torn Apart: thirteen refugees tell their stories. The same interview guide was followed with all storytellers: childhood memories, perceptions and experience of the conflict in their home countries, the effect of conflict on their lives and on their families, communities and countries; their journeys through Africa to Cape Town; their experiences here; and their hopes for the future. Some stories were recorded in the storyteller's mother tongue which were translated and published in English. Six workshops were held with the storytellers in Torn Apart to realise the book project. Other dissemination ideas for the interviews included: a child's life story for children, radio programmes for community radio stations, a documentary film and a wall mural. All except the life stories for children have been realised. Building trust was complicated because refugees have had many terrible experiences, some of which they want to bury forever. Many said, however, that they felt a sense of relief from sharing their stories and recounting their sad experiences. Some, on the other hand, said that their nightmares were recurring and they were referred to the Trauma Centre for counselling. We also managed to secure funds from Themba Lesizwe for healing workshops facilitated by the Institute of Healing of Memories. Overall the slow and careful way in which the project unfolded gave interviewees the time and space to develop trust in us and in the project as a whole. Thinking through the question of attaching their real names to their stories was on-going. Three storytellers in Torn Apart opted to use pseudonyms. Thirteen refugees from war torn African countries now living in Cape Town tell their stories. The stories evidence individual and familial trauma from the perspective of ordinary people whose lives have been profoundly altered by wars raging across the continent and the difficulties faced in South Africa. The stories are told by refugees from five African countries ravaged by war: Angola, Burundi, Rwanda, Democratic Republic of Congo (DRC) and Chad. The book was funded by The Ford Foundation Southern African Office. IDASA Democracy Radio Project assisted us to develop community radio programmes which dealt more specifically focussed on women and children. Brett Davidson (IDASA) and Mary Tal (HRMC) worked together and IDASA, with its community radio network, was responsible for its distribution. Directions to view the mural: From the M3 or Main road take Searle Street towards the mountain and turn right into Chester and immediately right again into .... The church building is on the left and there is a vacant plot in front of the mural side. In our shoes is a 40 minute documentary film set in Cape Town which focuses on the discrimination refugees and asylum seekers in Cape Town experience in their everyday lives. The characters share details of their experiences at school, work, and where they live, and speak about the discrimination they face, ranging from name-calling and exclusion to extreme and violent xenophobia. They also offer their insights into the reasons for this unwelcoming atmosphere, comment on local South African’s lack of knowledge about the situation refugees are in, and offer some solutions to counter discrimination and xenophobia. These stories are interwoven with discussions by two groups of Khayelitsha residents who hold opposing views about refugees and immigrants, highlighting local perceptions and prejudices. Additional interviews with South Africans further comment on the prevailing negative attitude to immigration and their opinions on this subject. All interviews were filmed during 2006 and 2007, in other words before the May 2008 outbreak of xenophobic violence, and give evidence of the long term discrimination that ‘foreigners’ face in South Africa. 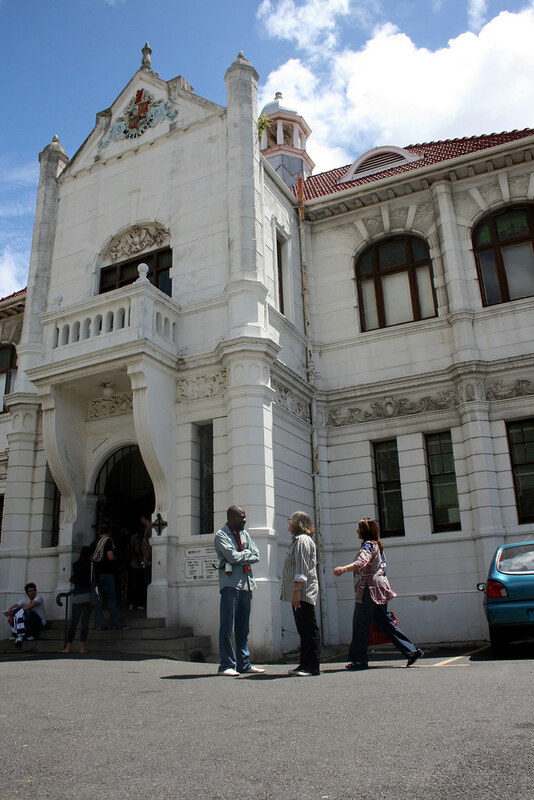 view Photographs of the launch of In our shoes on 29 November 2009 at the Mowbray Town Hall. The aim of In our shoes is to counter xenophobia by focusing on the dangers of negative stereotyping, and to offer a positive outlook on diversity in South Africa. The film has been edited into four chapters: ‘Why are refugees here?’, ‘What is our life like?’, ‘What is xenophobia?’ and ‘What can we do?’ The initial target audience is youth and learners, but the film has proven to speak to a wide audience. The stories give a personal and emotional 'inroad' to discussions about immigration, refugees, xenophobia and human rights in more general terms. Each of the stories raises certain issues (for example young refugees’ identity; violence and xenophobia) which can then be further discussed in facilitated sessions. The last chapter is intended as a prompt to think about practical steps that the audience can take to counter xenophobia in their own lives and communities. The Human Rights Media Centre is currently developing additional educational material as well as a facilitator’s handbook to accompany the DVD. As part of the development process we are screening the film to selected audiences in 2009, to engage a range of audiences and to gather feedback and ideas for the content of the materials as well as a distribution network and strategy. With these efforts, HRMC aims to develop an extensive outreach project for the Western Cape, in partnership with the Education Department, local schools, colleges and universities, CBO’s and NGO’s, churches, youth groups and refugee and immigrant advocacy groups, to support an on-the-ground, community driven campaign to raise awareness around xenophobia. The final phase of producing the film was funded by the Heinrich Boell Foundation and we are fundraising for the outreach programme.